The exhibition features Dianne Jones and Sharyn Egan alongside Indigenous TAFE students past and present, DADAA artists, textiles from Nagula Jarndu, Broome, weaving from Northam Yorgas, prints from Boronia Prison and paintings made with Derbarl Yerrigan Health Services plus gems from our NMTAFE Art Collection and work by Nyoongar weaver Janine Mcaullay Bott and textile artist and curator Michelle Broun. Indigenous TAFE students past and present include Simone Penny, Jade Richards, Seantelle Walsh, Nolene Hamlett, Hannah Collard, and Anthea Corbett. Mandy White, Raeanne Gilbert and Audrey Warbie develop their painting skills in sessions at Dadaa Fremantle and Midland (WA’s disability arts organisation). Boronia Prison women have created a set of prints. Nagula Jarndu is a fabric printing initiative in Broome. Derbarl Yerrigan is a Perth based health service assisting Indigenous clients and raising health awareness. They manage Autumn House, a residential facility for people coming to town for treatment from all over the state. Both have built an impressive collection of art as well as providing materials and support to clients who use art as a therapy and self-expression. Growing up in the WA wheatbelt, Dianne Jones has remarked that Aboriginal role models were scarce. This series, like much of Dianne’s provocative work, responds to that lack of black faces in the popular culture of the time, with Dianne staging images where she poses as Elvis, Audrey Hepburn, James Dean, Princess Grace and Clarke Gable. She reframes historical representation, turning the gaze and unsettling the viewer. Dianne is a Noongar woman from the Balladong area now based in Melbourne. Sharyn Egan is a Wadjuk woman. She is an accomplished fibre artist, sculptor and painter who exhibits and leads workshops across Australia as well as working in the realm of public art. Sharyn is a graduate of TAFE’s Claremont School of Art. 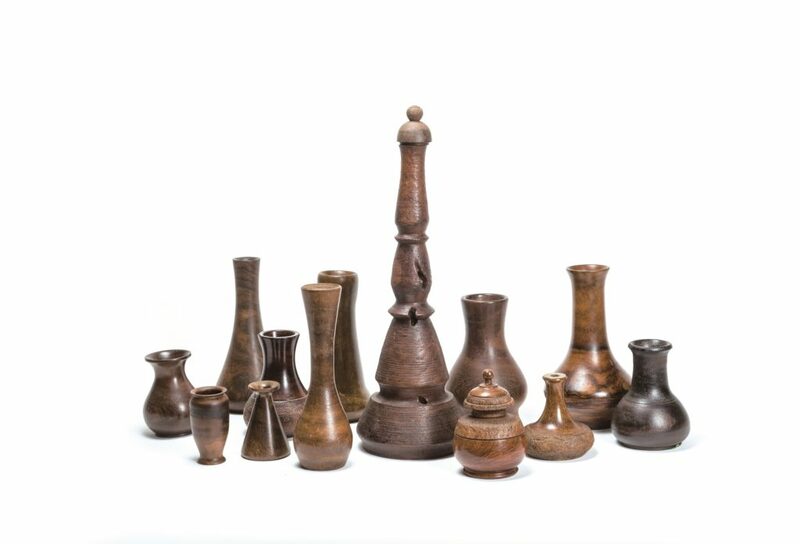 Her work Nullians is a collection of objects/vessels turned from Balga Tree stumps by white male woodworkers in the sixties and seventies. Sharyn scoured op shops across the south obsessively collecting these remnants that, just like Aboriginal people, come in different shapes, sizes and tones. When presented as an installation, a powerful sense of the past emerges, with reference to the clearing of native bushland to make way for suburban expansion. woodworkers in the sixties and seventies. Sharyn scoured op shops across the south obsessively collecting these remnants that, just like Aboriginal people, come in different shapes, sizes and tones. When presented as an installation, a powerful sense of the past emerges, with reference to the clearing of native bushland to make way for suburban expansion. Free Workshops in JULY – getting to know each other, learning, sharing.